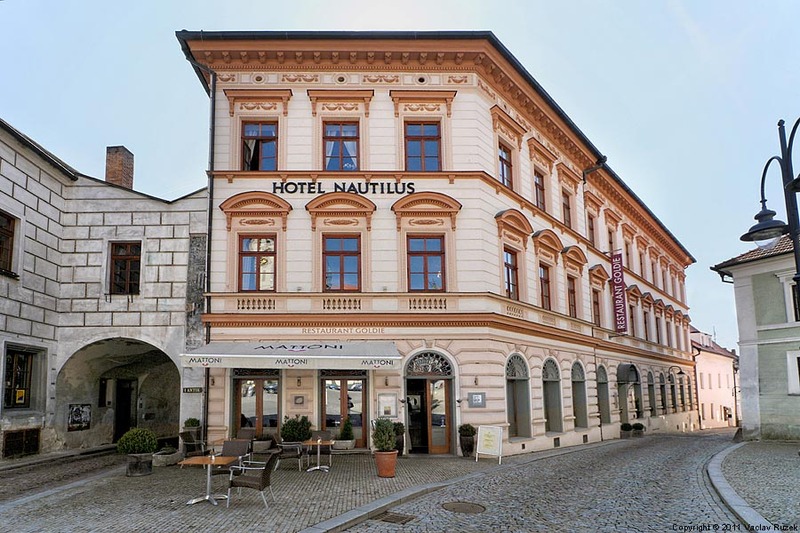 Hotel Nautilus is a 4* hotel situated on the main square of a beautiful medieval southern Bohemian town Tabor. Tabor is one hour by car South of Prague in the middle of the route to Cesky Krumlov. Its medieval old town, ancient fortifications including the gate of Bechyne and the Kotnov Tower, as well as an ingenious labyrinth of tunnels under the houses and streets is worth the visit. 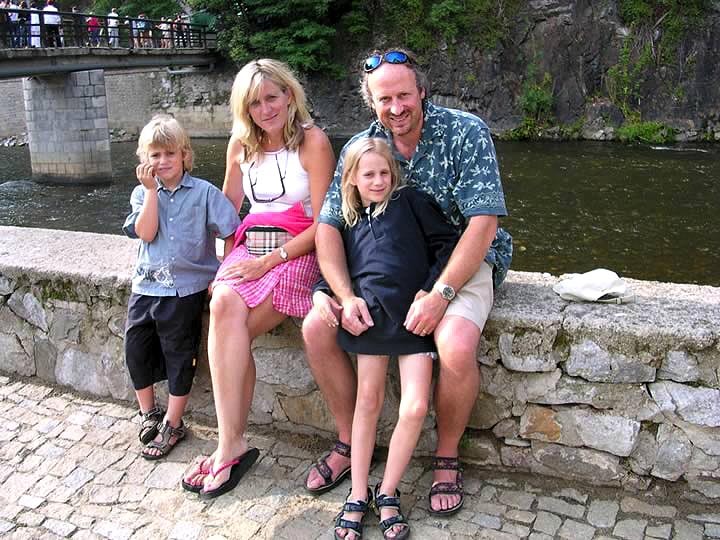 Tabor played an important role in the history of the Czech Republic. Founded in 1420, it is central to one of the most famous periods - the Hussite Movement and Hussite Wars. It is named after Mount Tabor, which is believed by many to be the place of the Transfiguration of Christ; however, the name became popular and nowadays translates to "camp" in the Czech language. In the centre of the city is Zizkovo Square. Only very narrow streets lead to it, to render the approach to it more difficult in time of war. 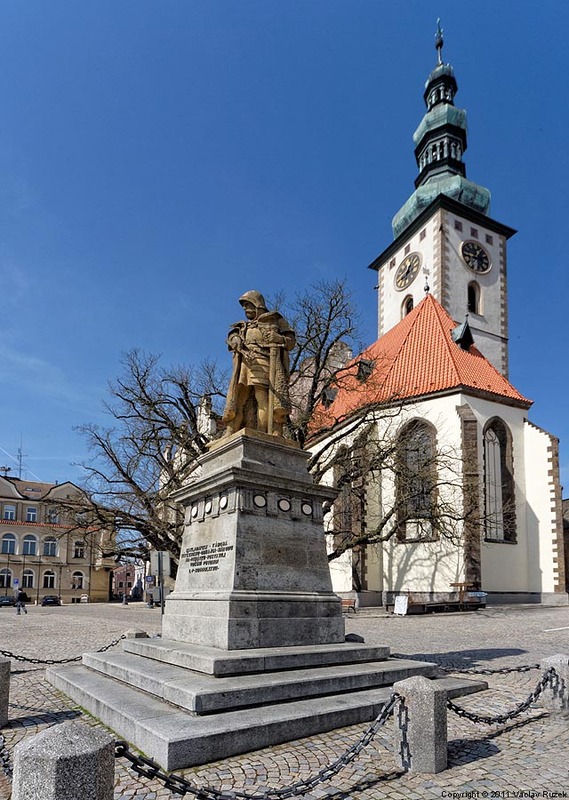 In the centre of the square is the statue of Jan Zizka, the greatest of the Hussite leaders. In 2002 a British couple, Angie and Neil Harbury, commenced a reconstruction of this historic building. 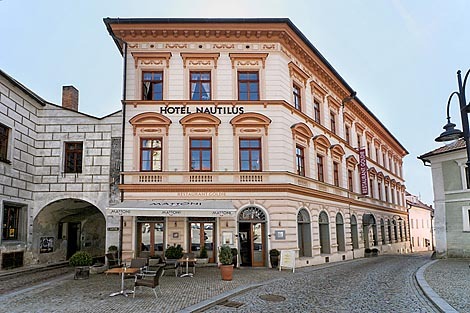 This was a large renovation and design project and it was not finished until March 2006 that they opened Hotel Nautilus and Restaurant Goldie. They have created a unique 22 bedroom 4 star Boutique Hotel delivering high levels of comfort and cuisine. The hotel itself is a work of art. We offer comfortable accommodation in 22 rooms including 10 double rooms, 3 deluxe rooms, 4 superior rooms and one room for disabled persons . 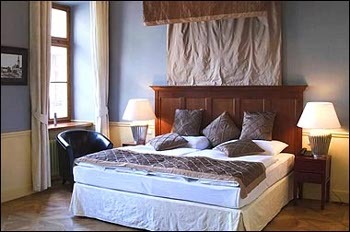 We have also three beautiful suites, and the best ‘room’ in the hotel the President Suite. 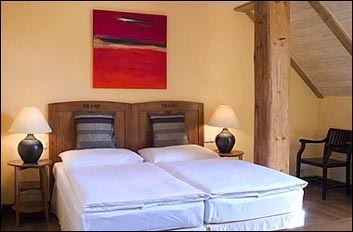 Each of our bedrooms is unique and is decorated distinctively with original oil and acrylic artwork, antique furniture and fossils to create a special ambience. You will love the beautiful etched or stained glass in doors, hand-blown glass lampshades and colourful mosaic borders to mirrors. 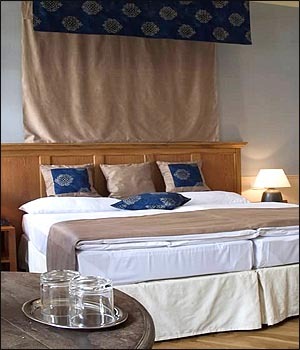 Silk cushions and lovely fabrics combine to make our bedrooms, warm, comfortable and stylish. 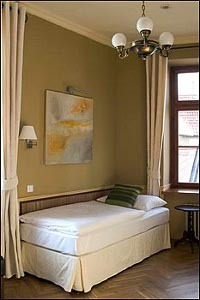 Our exclusive Deluxe and Superior rooms excel in size and many have superb views of the historical square. 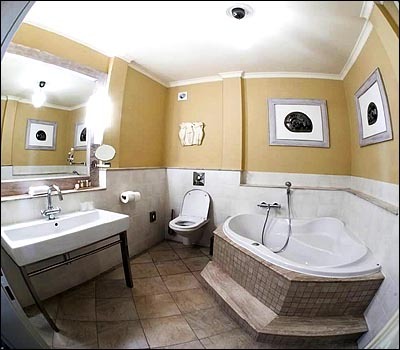 Luxurious suites with jacuzzi baths accommodate business clients, families with children and newlyweds (don’t forget to ask for the ‘honeymoon’ room). Rocks and fossils are common, particularly in our bathrooms - whether it be a 380 million year old nautiloid fossil from Morocco or 195 million year old Italian limestone table or bath surround. Our top floor bedrooms have their own magical atmosphere and most have wonderful views of Tabor rooftops and beautiful rolling Bohemian countryside to the south. These rooms have many enchanting features: mosaics, stunning doors with beautiful stained glass and even a mini theatre stage. When you are make a reservation, please let us know whether you would like to stay in one of our designated non-smoking rooms. 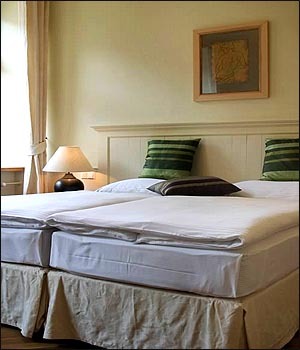 All our rooms have a bath or shower, WC, colour TV, direct dial telephone, minibar, hairdryer, broadband internet and a safe. 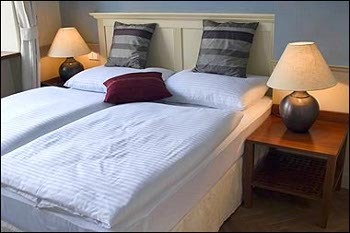 We have supplied all our rooms with English Hypos beds..“Makers of the Most Comfortable Beds in the World”. 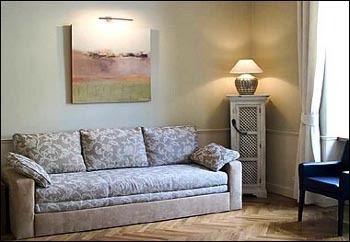 Hypnos are official suppliers of bedding and upholstery to the British Royal Family. 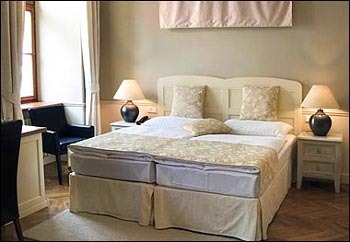 Hypnos is a family owned, family run company, which has been producing traditional hand crafted beds for over four generations. Our rooms are fully equipped for guests on business. Internet connection is free of charge and the ground and first floor have WiFi coverage. 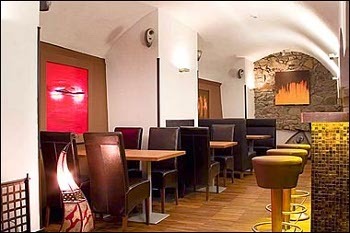 Delicious food and an extensive drinks menu are provided in the stylish hotel restaurant - Goldie. 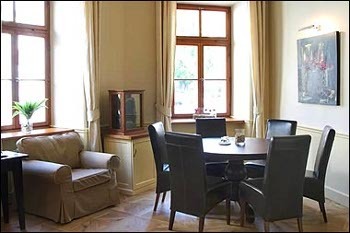 Its high ceilings and large windows provide an elegant and relaxed atmosphere and offer excellent views of Žižka Square. 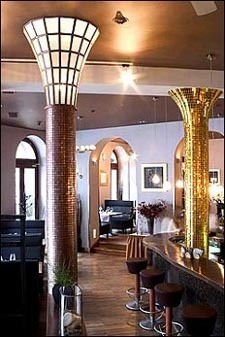 The lush golden interior has wonderful mirrors, sculptures and other works by local craftsman and famous Czech artists. 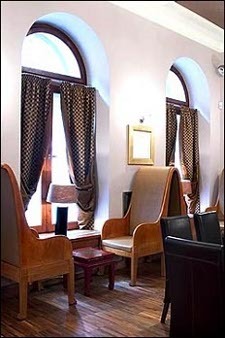 The public rooms offer sophisticated & contemporary areas where guests can enjoy excellent coffee or a beer or select from the well stocked cocktail bar. Guests can also choose to enjoy the Wine Bar, Atrium with fountain, palms and lush vegetation or our exclusive salon - the Gallery. 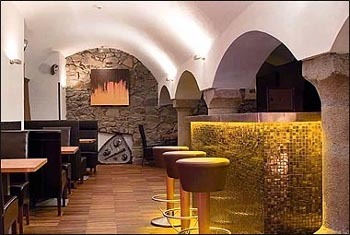 The cellar with 13th century stone pillars and arches has an entrance to the labyrinth of tunnels under the old town. Our rooms and suites offer excellent facilities for meetings, banquets and weddings. 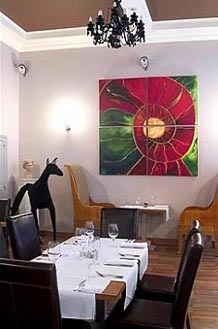 They are also a perfect place for that special meal and fine dining. All our hotel is individually decorated with all work being carried out by local craftsmen and artisans, which are both plentiful and skilled in Bohemia. 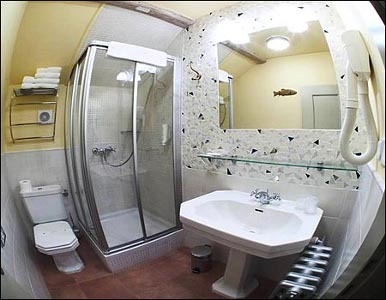 The decor is influenced by the couple’s background as geologists; each room contains a unique rock or fossil. Ancient stone and antique Art Nouveau and Deco furniture and lights are combined with original works of art & sculpture from both Bohemia and England. This blend of contemporary design and restored furniture provides our guests with an experience they will not forget. 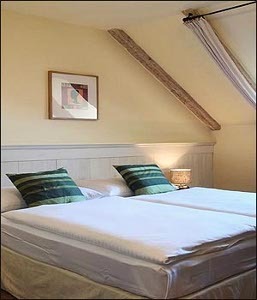 Prices of Family Suite are for 4 persons. All other ( except Single ) are for 2 persons.